During the recent cold spell in the UK where temperatures were below freezing for over a week and fell as low as -12C in places I brought in my solitary bee nesting tubes and put them in the fridge to keep them warm (a fridge keeps them at between 3 and 4C, still cool enough to stop them hatching). Having written about this on the Wiggly Wigglers Facebook group Heather also mentioned it during Podcast 165 so that other people could save their own bees. During the podcast Richard questions why I would do this so here are my reasons: Bees in the UK (solitary, Bumble bees and honey/hive bees) are suffering a lot in the wild at the moment and disappearing from our gardens at an alarming rate. 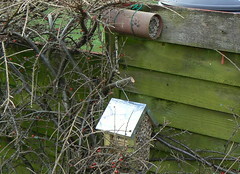 By putting in these nesters we are encouraging solitary bees, such as the Red and Blue Mason bees, into our gardens thereby saving them the bother of hunting around for suitable nesting sites and encouraging pollination of our plants during the summer. Plus they are amazing to watch, none aggressive and therefore suitable for a garden that also has children. However, they suffer the effects of the crazy British seasons just the same as anything else. For the last few years they have hatched early only to find there are very few flowers for them and this year we have had the first real Winter in years where it didn't get above freezing for over a week. So by putting the tubes in the fridge for a few days you actually keep them warm enough to survive the very low temperatures but cold enough not to start hatching in your fridge (and thereby saving me from an almighty talking to from Mrs Sherlock!). I originally got this idea from Christopher O'Toole, author of "The Red Mason Bee", which is available from Wiggly Wigglers by clicking here. Although he does state that they can be over-wintered in a shed or greenhouse he also states that a fridge is fine as it keeps them at a constant temperature and stops them emerging too soon into a cold Spring. HOWEVER, I would recommend only putting them in the fridge when you know the temperature is going to drop very cold i.e. -10C or slightly less if it's for a prolonged spell and even then only for a few days at a time. This is because modern fridges (often with auto-defrost) don't appear to keep the required humidity very well and you run the risk of drying the cocoons out. There is more about this on the Beediverse web site. Another reason for using your fridge is when Spring looks like it will come early. As mentioned above this then keeps them cool enough not to hatch out too soon. To quote Christopher O'Toole again: "... keep an eye on the weather and check with the long range weather forecasts. About seven to ten days before you think the fine weather will begin, put your bees out on your plot." Hi Simon, that is neat about bees. Never thought about that people could keep them in the fridge if it is getting too cold outside.